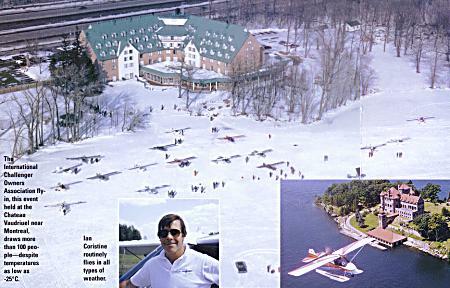 Kitplanes Magazine: "Challenger pilots enjoy year-round flying!" draws more than 100 people - despite temperatures as low as -25C. Left Insert: Ian Coristine routinely flies in all types of weather. the fortunes of the Singer sewing machine clan. Soaring in silence like a bird. Hissing to a stop on the waters of a remote lake. Blasting out of deep powder snow. Wandering wherever the spirit beckons in loose formation with good friends. Exploring nature and the scenery up close and personal in all four seasons on skis, amphibious floats and wheels. These are the adventures I delight in. I do all these things with a single airplane. My two-seat Challenger is classified as an Advanced Ultralight in Canada, or as a Homebuilt in the United States. It looks and is quite different from general aviation airplanes and it is equally distinct from the "bugs in the teeth" style of ultralights. While General Aviation airplanes have distanced themselves from recreation by focusing instead on transportation, the Challenger is totally focused on recreational flying where its versatility and flight at the slower end of the flight envelope make it ideal. Optimizing the four primary ingredients that govern the performance of all airplanes - weight, power, lift and drag - the Challenger is extremely light, yet through the use of aircraft materials, it is very strong. It has a large area high-lift wing, lots of horsepower per pound and tandem seating to reduce frontal area and drag. The result of this blend of ingredients is an unusually wide speed range (4:1 from stall to top speed), docility, great slow-speed handling characteristics and strong STOL performance. These characteristics let the Challenger take on a wide variety of tasks that would normally require a collection of purpose-built airplanes. My Challenger lets me get completely away from the beaten path and the cumbersome regimentation and procedures of busy airports and crowded airspace while giving me 12 months a year of flying. It has forever changed the pleasure I get from each of the four seasons. Winter is no longer synonymous with long, cold and boring. It is instead my favorite time to fly. Rather than putting my plane away until spring or tiptoeing carefully between plowed runways on wheels like many have to, I put on the skis, flip on the heater and enjoy "go anywhere" winter freedom. Runways are everywhere, almost literally anywhere white, be it a snow-covered field or a frozen lake or river. The Challenger's light footprint, high-lift wing and strong power-to-weight ratio give it extreme takeoff performance which is further enhanced by the dense winter air. This is especially important because it means the plane doesn't get stuck in heavy or wet snow conditions, a common and sometimes dangerous problem (the long, cold walk home) for conventional ski planes. Flying the day after a fresh snowfall is particularly delightful. The view of the countryside is like scenes from a Christmas card, with a sparkling white blanket covering the ground and cloaking the trees. Landing in fresh snow is like landing on a cushion of cotton and great for the ego. It's difficult to tell exactly when the transition is made from flying to taxiing. Copyright Ian Coristine. All rights reserved.